Shining, streaked pink Asiatic Lilies incorporated creatively with Gerberas in varying tones of striking pink makes this bouquet a veritable tingle tangle of irresistible pink. Send involve to someone you are connected to or want to be connected to. 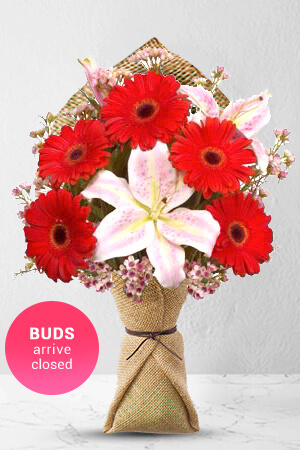 Lilies may be sent closed/partially closed in order to prevent damage and to last longer.The vase in the image is not included, however for a lasting impression we recommend you purchase a Standard Vase which perfectly complements Involve. Brilliant service. Very impressed. Will definitely use again. Short notice and a weekend order to boot. Couldn't have expected earlier delivery. Thank you. And the recipient wad delighted. Received a call to let me about substitute colours and flowers delivered promptly. Great range and prices to choose from. The hardest part was making a selection!